Clearly, the last divisor is 150. Hence, HCF of the given number is 150. Clearly, the last divisor is 19. Clearly, the last divisor is 95. Hence, HCF of given numbers is 95. We know that two numbers are co-primes if their HCF is 1. Clearly, the last divisor is 1. Hence, the given numbers are co-primes. Hence, the given numbers are co-prime. What is the H.C.F of two consecutive numbers? 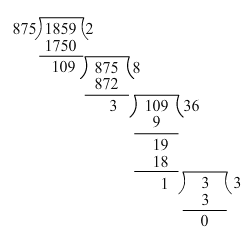 The HCF of two consecutive numbers is 1. D = 4 and d= 5 are two consecutive numbers. Hence, HCF of 4 and 5 is 1. (ii) The H.CF of two co-prime number is 1. (iii) The H.CF of an even and an odd number is 1. False. HCF of 6 and 9 is 3 not 1. (iv) The H.C.F of two consecutive even numbers is 2. (v) The H.C.F of two consecutive odd numbers is 2. HCF of two consecutive odd numbers is 1. Example: HCF of 25 and 27 is 1.